Those wishing to dispose of any of the above listed items should make arrangements directly with a licensed hauler at their own expense. Your service day may be changing as of March 4 and March 5 depending on your address. If you live on the south side of Benton Avenue, your service day will be Monday. If you live on the north side of Benton Avenue, your service day will be Tuesday. For many of you there will not be a change. However, we wanted to communicate this to all City of Albia residents. If there are questions, please call our office at 641.628.2610. Once again, thank you for your business. We look forward to a great future of providing service to the Albia community. 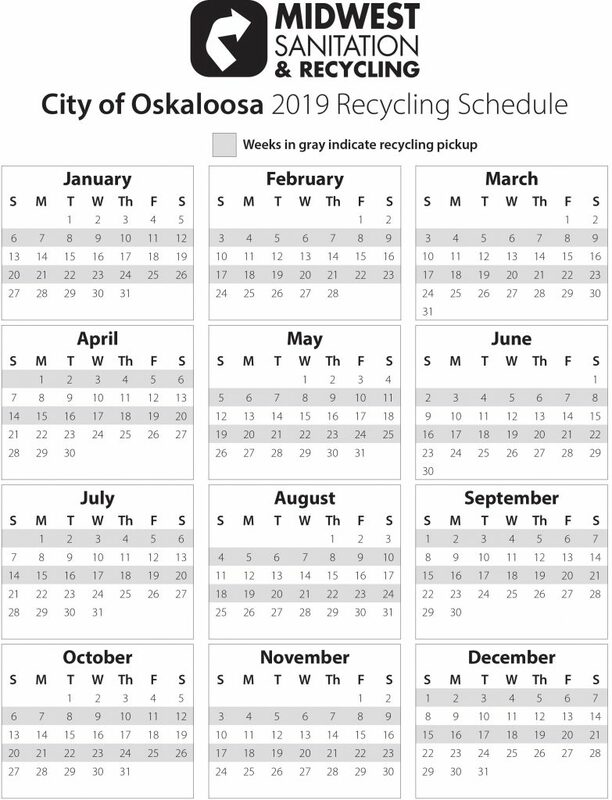 The City of Oskaloosa in 2019 will have recycling picked up based on the calendar here. Feel free to save and/or print this attachment for your record. Recycling will be picked up on the 1st and 3rd weeks of the month, collection will happen on the gray highlighted weeks in the calendar here. If there are more questions, please call us at 641.628.2610.